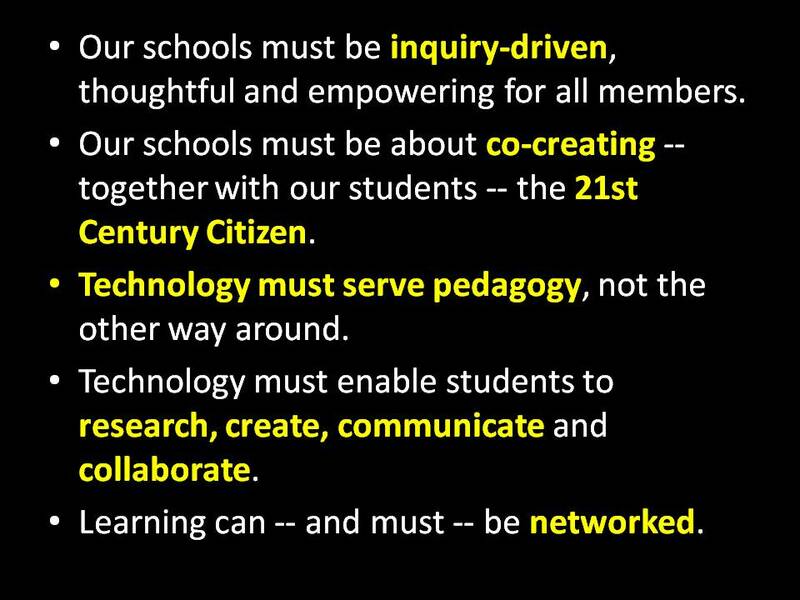 There are also frequent references to those other educators who do not “get it.” Yet, it is never clear, at least to me, what the “it” is that other educators are supposed to “get.” There are references to School 2.0, Classroom 2.0,etc. Significant technology integration is certainly implied, but even that is a loosely defined concept. The “Digital Natives” Argument – yes, I’m well aware that “we” have largely denounced the digital natives-immigrants dichotomy, and I’m on board with that. However, I see a new, related line of thinking that is equally problematic. It has to do with the notion that kids are really comfortable with technology, they use it a lot, so we should bury them in it at schools too. When the recent Kaiser Family Foundation report was released, it spread like wildfire among “our” networks/communities. Here are the money lines: Today, 8-18 year-olds devote an average of 7 hours and 38 minutes (7:38) to using entertainment media across a typical day (more than 53 hours a week). And because they spend so much of that time ‘media multitasking’ (using more than one medium at a time), they actually manage to pack a total of 10 hours and 45 minutes (10:45) worth of media content into those 7½ hours. Well, there you go. Given *that*, how can we NOT make our schools more “relevant?” HOLD ON…what’s the logic there? Just because that’s what kids do on their own time, that’s how we should engage them in schools? Why is that exactly? Maybe, actually, what we need to be doing is using that evidence to argue for maximizing face-to-face time. In fact, this gives me even more reason to argue for the “flipped classroom” model that you see discussed here. Let’s “disrupt” or “interrupt” kids time online by, where necessary, providing content or instruction via digital means so that when they come to school they can learn to interact with each other and learn socially while face-to-face. The Economics Argument – this is the argument based, often, in the works of (non-economists) Daniel Pink, Richard Florida, etc. It is a big part of presentations done by folks I admire greatly, including my friend/colleague Scott McLeod. Watch and/or listen to Scott’s presentation to the NEA and you’ll hear a lot about the changing nature of the workforce and how we need to reform schools to meet those changing needs. I get that, kind of. Here’s the problem. If you make that argument, you have to believe that one of the fundamental purposes of schooling is, in fact, to prepare kids for the workforce. That’s not at all something I believe. For me, first and foremost, schools are in the business of preparing kids to be active, productive citizens in a deliberative democratic society. Schooling for citizenship and deliberation, not employment. I want to remove all references to “workplace” or “workforce” or “economy” from any and all school mission statements. If I argue or advocate for technology integration in schools, it is based on the idea that we need to recognize that the Web is causing us to rethink what citizenship means and is increasingly becoming a space where important deliberation happens (see e.g. the ways in which social media impacted the last presidential election in this country). We need to help kids become deliberative and to express their ideas and thoughts in productive ways in spaces that are digital and PUBLIC. That said, building upon my notion of maximizing face-to-face time, let’s think about ways to use school time to foster civic engagement and deliberative habits. As far as I’m concerned, every kid should be required to take a debate class. The Business Argument – this argument was bolstered by the publishing of Disruptive Class which is based on the theory of disruptive innovation developed by of one of the book’s authors, Clayton Christensen. The general premise there is that technology will increasingly allow us to individualize/customize learning and makes learning possible anywhere/anytime and that is an innovation that will disrupt the model of formal schooling as we know it here…unless, of course, schools figure out a way to head off that disruption at the pass. Let’s say we accept the book’s premise. Then what? It was NEVER clear to me in reading the book what it is that schools need to do in order to not get “disrupted.” Are student-centric learning technologies that customize learning the disruption or the prescription against disruption? I may be missing that, and if so, I’m willing to listen. But, if “we” include the “Disrupting Class” thinking in “our” arguments, “we” need to be prepared to then tie the vision of the “it” that “they” are supposed to “get” to the logic of disruptive innovation. In other words, it’s not enough just to say that the current model of schooling is going to be disrupted. That said, I’m not accepting the book’s premise, largely because I’m missing the last link in the chain of logic. I also still don’t understand why the author’s went after K-12 education and not higher education. Higher education is a choice (to a degree). Up to a certain age, though, public schooling is mandatory. It’s also, for most people, a public enterprise and not a profit-driven one, and I don’t think the theory of disruptive innovation works in that context. For a more thoughtful critique of Disrupting Class, I encourage you to read this critique by Andy Zucker of the Concord Consortium. The “Bored Kid” Anecdote – OK, @bengrey, your turn under the bus. So, lots of attention was given to the story of Aaron Iba, the now former CEO of AppJet, the company that created EtherPad. Ben wrote about Aaron’s story here. Lisa Nielsen wrote about it here and here. Aaron’s story is not a new one. And, I know Ben and Lisa and others know that. In fact, that was pretty much their point. Since forever, kids have been bored in schools. Well, guess what? For all of the Aaron’s out there, I can point to a…well…me. School worked beautifully for me. I’m the perfect anecdote for maintaining the status quo in schools. I loved school. I got to learn, largely by myself, and that’s what I liked. Teachers soothed my ego and made me feel smart and great and I achieved at high levels. So, why isn’t anyone blogging about me and how schools work? Additionally, the Gladwellian tactic of finding a case to fit an a priori belief is not compelling to me. I think case studies can be immensely interesting and meaningful, but only if done thoroughly and systematically. Gladwell gives us bits and pieces of his cases and, as a result, we can’t know how well that case “fits” his theory because we don’t know enough about the case. Same with Aaron Iba. Do we really have enough information here to know the whole story? To conclude that the schooling system failed Aaron? Writing a good case study is hard to do. When done well, though, they are deep, rich narratives that are full of meaning; they aren’t meant to be “generalizable” though. One last question about the “bored kid” anecdote: what makes you think the “it,” the “new” school or modes of learning that you apparently have in mind though haven’t quite fully articulated will be not boring for everyone? In sum, then, I think “we” are putting broken carts before the horses. “We” are concentrating too much on the “why change” argument without first fully and clearly articulating what it is “we” want from schools. Furthermore, the “why change” arguments, I argue (meta? ), are fundamentally flawed. There are lots of reasons for the institution of schooling to be transformed. Likewise, there are lots of reasons to consider the affordances of ubiquitous computing for learning. I ask you to help me think through those reasons in ways that are well-informed and logical…especially those of you with whom I hope to have fully maximized face-to-face experiences this weekend at Educon. I look forward to deliberating with many of you there! This entry was posted on Friday, January 29th, 2010 at 1:10 am	and is filed under 21st Century Education, community, Ed. Policy, Ed. Tech., learning. You can follow any responses to this entry through the RSS 2.0 feed. You can leave a response, or trackback from your own site.